On my journey to the Philippines from Vancouver, my $340 flight consisted of a 13-hour flight to Shanghai with a 24-hour layover on my way to Palawan. I was surprised to find that customs had given me a 144hr transfer visa which meant I now had two options: stay in the airport drinking expensive coffee at Starbucks with no wifi or explore China’s greatest city: Shanghai. Clearly, I chose the latter and headed straight to the ATM to pull out 153 yuan, equal to $30CDN. I waited for the metro to open, spoke to locals asking where to go and hopped on the China Metro ready for an unexpected adventure buzzing with exhaustion and excitement. If you have 24hrs in Shanghai, this route will pack a punch indulging all your senses in a small timespan. Cost of Metro: 8 yuan, Time: 1hr 40 Min. Qibao is located in the suburbs of Shanghai and allows you to get a small taste of what an ancient town in China is like. 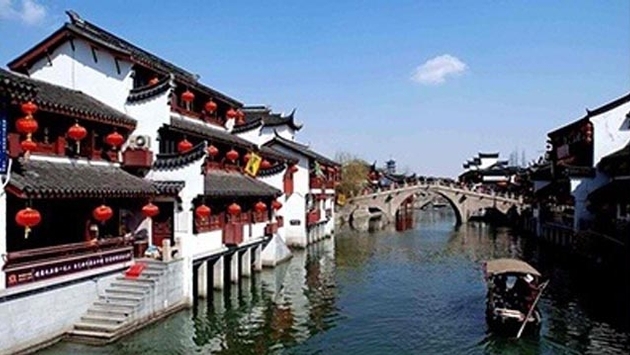 Wander through the pedestrian streets to time warp through ancient architecture, 2 striking canals while trying the local Qibao wine while taking a million photographs of the ancient beauty. Cost of Metro: 5 , Time: 1hr 40 Min. Head to The City of God Temple Snack Square dubbed as “Shanghai Snack Kingdom” where you can fill your bellies with miles of local eats. Try the Nanxiang steamed and stuffed buns, the Chop Rice cakes, Cream Spiced Beans and Crab-Yellow Pastries. When you’re full to the brim, walk over to Yu Garden to burn off those calories through a 5-acre, 400 year old classic Chinese garden located in the Old City of Shanghai. Here you can explore the 6 beautiful areas of the grounds, various carvings and sculptures as well as the bazaar. If you love to shop, look no further than the famous shopping area of East Nanjing Road. To visit the essential stretch, take a walk between Huanghe Road and Henan Zhong Road to visit famous stores and to burn a hole in your pocket. The Bund stretches for a mile long along the Huangpu River and displays a striking view of the iconic Pearl TV Tower. The panoramic views are a must when visiting Shanghai. 5th Stop: Power napping to avoid jetlag. Cost of Metro: 7 yuan, Time: 62 min. By now, you are probably exhausted and ready for a snooze. Walk back to East Nanjing Metro and ride Line 2 all the way to Pudong International Airport to find relatively comfortable cushioned chairs in Departures and take a nap before you hop onto your next flight as to not have jetlag. Shannon Wolf is a freelance photographer and writer, traveling across the globe with an open itinerary and no intent of stopping. Originally from Toronto, Canada, she left behind a fast paced life to truly live and not just exist in an attempt to inspire others to follow their bliss. At age 26, Shannon has visited 20+ countries on four continents around the world. She has travelled overland by chicken-bus and tuk-tuks, hitchhiked by fruit trucks and through islands on horse and buggy. She has slept in the jungles of Nicaragua, on benches in London, secluded hidden beaches and she’s only getting started.